On September 12th, 2004, Wendy Connors ( Ufological Historian/Researcher) accompanied Ed Gerhman to the location that he suggests is “the cameraman’s crash site”. Ed Gehrman's original article - "Creatures with no business here - Part 1"
Ed Gehrman is a retired special education teacher whose specialty was working with very disturbed children. Ed began writing professionally in 1988, primarily about social and environmental matters. Ed does not regard himself as a “Ufologist” but has always been intrigued by UFOs. He became mildly obsessed with the “Alien Autopsy” film (see below) and has defended Col. Corso. In a nutshell, Ed describes himself as “a regular, run-of-the-mill UFO nut and environmental reporter”. "From the start it was plain to see this was no Russian Spy Plane. It was a large disc "flying Saucer" on its back with heat still radiating from the ground around it...It was decided to wait until the heat subsided before moving in as fire was a significant risk, this was made all the worse by the screams of the Freak creatures that were lying by the vehicle. What in gods name they were no one could tell but one things for sure, they were Circus Freaks, creatures with no business here. Each had hold of a box which they kept hold of in both arms close to their chests" The Cameraman. "My wife and I were returning from in trip to New Mexico, Sunday, September 3,1995. FM reception had been poor that day so as we approached Reno, I turned on the radio, hoping for some mellow sounds. Luckily, the scan-tune landed on Art Bell's Dreamland, and I lingered there for a consequential moment, listening to an expert on movie cameras explain film dating. The substance of his remarks and the subsequent wrap-up by Bell seemed to indicate that the Roswell Alien Autopsy footage, shown on Fox TV the previous week, was probably authentic. Could this possibly be correct? All the communication coming from the UFO community for the last three months had been contrary to this notion. Art Bell's contagious excitement piqued my interest; I decided to re-examine my assumptions about this potentially explosive but controversial film footage. I hope you will, too." That's the way it all began for me and my involvement with the Santilli Alien autopsy. Since then my main focus has been to try and convince other members of the UFO community to take another look at the autopsy footage. It has been an uphill struggle. I've spent many hours viewing the AA footage and I'm convinced that it portrays a real event. Nothing seems out of place or consistent with a hoax or fraud. During July, 2002, while on a visit to New Mexico, my brother and I decided to try to locate the UFO crash site described by the cameraman. The cameraman's story is really quite simple. Ray Santilli bought twenty-two rolls of film from him showing the dissection of a creature of unknown origin and the debris of its crashed craft. The price was $100,000. The cameraman supplied diaries and photo albums to prove he really was who he said he was. But insisted that his identity be concealed. He provided a brief account of his involvement which Ray released as the “Cameraman’s statement”. He also was interviewed by Japanese TV. He was not a figment of Santilli's imagination. In 1995 when the alien autopsy was more immediate, several researchers decided to try to find the crash site described by the cameraman. They communicated with the cameraman via Ray Santilli and obtained a set of directions to the site. The directions were very specific on how to get to the general area but not specific as to exactly where the site was located although he did provide a rough map. The site they finally identified didn't exactly match the description given by the cameraman although several features were close to the mark. The main reason it shouldn’t have been considered a likely site is the absence of the blue, glass-like material the cameraman described. Unfortunately, they were four miles short of their goal. Had they travelled a little further down the arroyo they were searching, they would have come to the site my brother and I found and the whole AA story might have had a different reception. It took us about four hours of searching. We used topographic maps and the cameraman’s directions and descriptions. We’ve been exploring the New Mexico desert since we were teens. My brother still lives in Albuquerque; I lived there on and off from 1957 to 1965, and attended University of New Mexico and taught in Albuquerque for a year. We are very familiar with the terrain. The site is easily reached by four-wheel drive. I believed the cameraman's account, so I felt we'd find the site if we looked closely. There is a road that takes you there, now, but the main road used by the ranchers in the area wasn't used by them in 1947. Even today, it's just a path through a dry wash or arroyo that gets repaired once or twice a year and is mainly kept open by the ranchers. It's passable, but barely and can't be used during rains because of flooding. Presently there are three routes to the site but in 1947 there was only one road and one possible entryway. We followed the cameraman's directions which were to head south-west from Socorro on Hwy 60 toward Magdalena and take the last turnoff south before the Magdalena Mts. This is a dirt road that winds around, and in front of the “red pillars” (AKA the Box Canyon) and then up into a small range of mountains and through the various mining claims and debris piles and then out again onto the mesa. It’s the only road that was in existence in 1947 and it serviced the mines and one lone ranch which is now burned and abandoned. 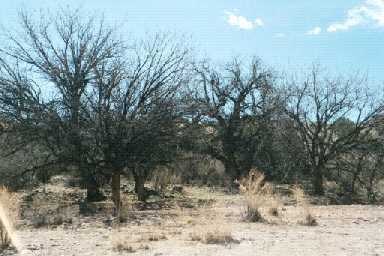 There are other ranches in the area but all were established after 1947. We were able to find the outlines of the old road the cameraman described which, at that time, was further up the mountain than it is today. We followed that old road and found where it ended at the side of a steep arroyo. We discovered that the road began again on the other side of the arroyo. This indicated to us that there had been a bridge across the span at one time. We did not find any evidence of a wooden bridge but in 1986 there was a massive flood that could have washed away any existing structure. The present road has been re-routed down through the canyon, just as the cameraman described. The cameraman's directions seem very accurate. He reported that he hugged the mountain, which is exactly what happens; he stated that he crossed a wooden bridge which had been taken down on his second visit to the site, about twenty years ago. Then, he had to drive down into the canyon, which is the same road we took. After leaving the mountainous area, we headed south east and followed the drainage through several arroyos. We travelled about four miles before arriving at the site, which was noticeable immediately by the strange blue material covering rocks and outcroppings, just as the cameraman had predicted. We also began to notice burned vegetation. The crash site is about forty-five minutes from the main road. We clocked it several times and that seemed about right. The cameraman indicated that the site would be on the northeast bank of a dry lake bed (the only dry lake bed in the area as far as I can tell), and at the end of a deep canyon. This is accurate. His specific knowledge could not happen by chance. The cameraman had to have visited this site at one time. It's not reasonable to think that he could have stumbled on to a freak accumulation of blue, glass-like material then faked twenty-two rolls of film to fit with the location. This is not a well know area, and only visited by a few rock hounds and local ranchers, in 4x4s. The two cliff faces the craft impacted were covered by the strange glass-like material and there were bits and pieces of this material covering an area as large as three football fields. The desert vegetation and trees are severely disrupted and this fact is clearly seen. There is a half-burned cottonwood tree about one hundred feet from the impact cliff, mute evidence of the event. Those not familiar with the desert would not understand what they were seeing, but if I were to point out the disruption, it would be clear and obvious. In the desert, growth and change are measured by millimeters and sixty years is a drop in the bucket of time. The desert changes slowly and fire is seldom a factor where only sparse grass grows with yards of space between clumps of vegetation. At one time there was a very hot fire in this secluded canyon. And it came from above. The entire site shows evidence of being very hot at one time but it is most noticeable around the impact site and the landing site. There are several dozen burned and dead Junipers but the interesting fact is that they only show scorched surfaces on the top of the limbs and not on the underside. This would seem to indicate that the source of heat was from above and not caused by a brush fire from below. There is also a three hundred yard row of Walnut trees that mark the path of the craft as it approached the first impact area. We examined every tree in the grove. Their crowns are burned and damaged and again, all the scorch marks are on the topsides of the branches, indicating heat from above. We took photos and samples of this burned material. CLOSE-UP OF COTTONWOOD SHOWING BURN MARKS ON THE CROWN AND NOT AT THE BASE OF THE TREE. BURNED WALNUT TREES. ALTHOUGH NOT APPARENT IN THIS PHOTO, THE BURN PATTERNS ARE FROM THE TOP DOWN. THIS PHOTO WAS TAKEN IN THE WINTER, BUT DURING THE SUMMER AND FALL THE DEAD AND BURNED PARTS OF THE TREES CAN CLEARLY BE SEEN. The walls of the cliffs consist of volcanic ash deposited years ago while extremely hot. The rock it became, Rhyolite, is dense and loaded with various minerals including gold, iron, iron pyrite, and copper. There are also and pockets of crystals. geology, and knew the glass-like rocks were highly unusual) so we took a sample to him for a superficial analysis. He couldn't identify the strange material and was somewhat surprised at his inability to do so. He examined the sample with a light enhanced magnifying scope he had on his belt and just shook his head: "I don't know what this". Identifying the strange glass-like material. Since then, I’ve explored the site thoroughly accompanied by my wife and brother; I’ve tried to interest others in a careful, forensic exploration. By the time my brother and I began searching for the site, the Alien Autopsy had been relegated to either the gray basket or the wastebasket of most respectable UFO researchers; we knew that anything we found would be suspect unless we supplied tangible proof. As I have stated before, both my brother and I are very familiar with New Mexico history and geology and what to expect when we hike the desert, so we both were excited when we found an area, larger than three football fields, covered with a strange glass-like material that neither of us could identify. CRISTOBALITE COVERING A RHYOLITE OUTCROPPING AT BASE OF 1ST IMPACT CLIFF FACE. At the time, I didn't realize just how difficult it could be to identify a mineral sample. I now know better; the only precise method is X-ray Diffraction. I had sent samples of the strange material to many researchers but while most found it unusual, they couldn’t positively identify what it was. 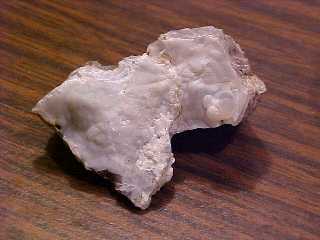 Some thought it was a form of agate (Chalcedony) and one said it looked like igneous calcite. I sent samples to the BLT ( Burke, Levengood, Talbott) research team and they found it interesting but nothing definitive. Finally I sent some to Phyllis Budinger who performed a IR spectra as well as microscope pix. She suggested Sampath Iyengar, a PhD chemist, with a degree in mineralogy. He owns a lab in Wildomar, CA. and is considered an expert with XRD (X-Ray Diffraction) which is a powerful technique for identifying minerals. I sent Dr. Iyengar a sample of the material and he agreed to test it for me. The results were unequivocal: the material was Cristobalite, a high temperature indicator, forming at above 1450C. It was a melt on top of the rhyolite and not formed from the rhyolite. Cristobalite is never found under the conditions that exist at the crash site. California; and Crater Lake National Park, Klamath Co., Oregon." We found several areas where the sand and gravel were covered with cristobalite. The site is part of an open range; much of the area has been trod by cattle for the last fifty-five years and the sand has been disturbed by their wanderings but in some inaccessible places there were mats of cristobalite covering sand and gravel as large as five feet by ten feet.. It seemed obvious to us that no ancient volcanic event could account for this phenomenon. Some matted cristobalite was an eighth of an inch thick and not only covered sand and gravel but dirt as well. There is not any evidence that this site was once a caldera. There is only evidence that this area is a rhyolite formation as much as fifty feet thick and was created by falling ash from a volcano. That was the last geologic event. Since then the rhyolite has been eroded by wind and rain and the entire area for over two hundred square miles is exactly the same desert sand and rhyolite outcroppings, except for the crash site, which differs only by the cristobalite material and the burned vegetation. Outside this line of demarcation there is only desert sand, rhyolite outcroppings, and the normal desert vegetation one would expect. 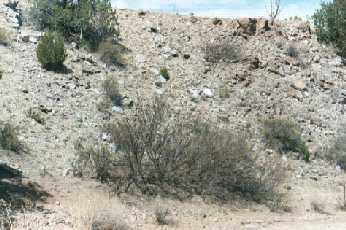 Cristobalite is scattered across an area at least three football fields in size. In some sections it's much thicker than others and on some rocks it's just a thin coating. It's on large rocks the size of a car and on small rocks the size of a loaf of bread and some the size of apples. It's more concentrated around the first impact site and the eventual crash (landing) site. The site is a little larger than I first supposed. It's length from east to west is six hundred yards and its width from north to south is five hundred yards. This includes the Walnut grove and the two cliffs the craft impacted. There are no signs of the cristobalite material anywhere in the surrounding desert that I have visited. SECOND IMPACT SITE AND FINAL RESTING PLACE FOR THE CRASHED CRAFT. AERIAL PHOTO OF CRASH SITE SHOWING DRY LAKE BED. 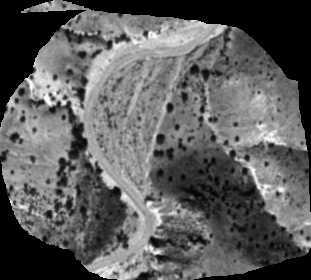 THE 1ST IMPACT SITE IS LOCATED IN THE LOWER MIDDLE AREA JUST WHERE THE STREAM BED BEGINS ITS CURVE TO THE LEFT. THE STREAM BED RUNS TO NORTHEAST AND THE 2ND IMPACT SITE IS TO THE LEFT OF THE STREAM BED IN THE ‘V’ CREATED BY THE TWO LARGEST TREES. The cameraman assisted an artist who was commissioned to draw the crash site. I believe the artist used photos, supplied by the cameraman, to sharpen his wits because the details of the terrain are just too accurate to be drawn from memory. I've taken the drawing to the site and have been able to compare it to what is actually there. The cristobalite that can be clearly seen in the drawing, is also found covering the site. The background terrain at the site is exactly the same as the background in the drawings. The drawing also show the craft and two aliens. The craft is intact. The aliens seem to be dead or dying. By the time the cameraman arrived, probably around 5PM the next day, the site had cooled for twenty-four hours. It was still hot but not that hot. For the craft to have survived, there must have been a heat shield to prevent meltdown. The suits the creatures wore probably protected them to a certain extent. Since we now know for sure that the strange material is cristobalite, which only forms at extremely high temperatures, how did it get there? I do not contend that the heat from the craft formed the cristobalite by melting the rhyolite rock at the site and transforming it. I argue that silica (desert sand) was picked up in the disabled craft's vortex, which melted it and deposited it at the site when it impacted the first cliff face and then again as it finally came to rest about two hundred yards to the northeast. I base my ideas on the work of Ivan Sanderson, and my understanding of vimanas, the flying crafts used by the ancients of India. The basic concept is that heated mercury in a circular container creates an electromagnetic vortex and the craft rides in the middle, as in the eye of a storm. This vortex is responsible for simple crop circles, and falls of angel hair. The disabled craft picked up sand (silica dioxide) and converted it along with atmospheric moisture and other chemicals and debris to form the cristobalite which it dispersed when it crash-landed. We can learn a great deal about our common alien predicament by studying the alien autopsy footage. I think it's a shame that most serious investigators don't understand this. The footage was kept secret for half a decade, and when it was finally made public it was shrouded in a veil even more opaque than secrecy: ridicule. There is overwhelming evidence for its authenticity and virtually no hard evidence against it. Our culture’s systematic refusal to seriously consider this footage raises an urgent question: have we lost our ability to objectively examine important, history-altering evidence? The Alien Autopsy is a maddening example of how easy it is for the government-controlled media to discredit something by hiding it in plain sight. There is still much to be accomplished before the cameraman’s crash site can be validated. The site has barely been mined for the vast amount of information it could supply. Burned tree limbs and scorch marks on surrounding vegetation need to be analyzed. Tree rings could be studied to determine the exact year of the disruption. Or you might have a true adventure and try to find the site from the clues I’ve given above or contact me for specific directions. Once you visit this secluded dry lake, you’ll soon see my reasons for believing that a craft and creature of unknown origin crashed there in the late afternoon, May 31, 1947.